When it comes to semiconductor technology space, United States holds the leading position in multiple areas. US has most advanced semiconductor fabs in the world and also the best fables semiconductor companies in the world. As for the latest study by IC insights, customers in the Americas region (primarily the U.S.) are expected to account for nearly two-thirds of pure-play foundry sales in 2013, a slight increase from 2012. IC Insights forecasts that Americas region will represent 70% of TSMC’s sales, 67% of sales from GlobalFoundries, and 47% of sales from both UMC and SMIC, see the figure below. While the revenue of fabless design companies grow in US, China and Taiwan emerging as the next region in growth of revenue and number of fabless chip companies. The Americas region is forecast to account for $22.4 billion of the $36.3 billion worldwide pure-play foundry market in 2013, which is up from $19.2 billion (61%) of the total $31.7 billion pure-play foundry market in 2012. 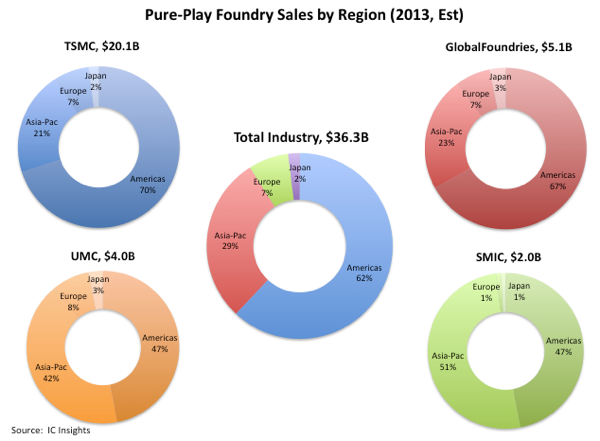 The Asia-Pacific region is forecast to represent $10.7 billion (29%) of pure-play foundry sales in 2013; and Europe, $2.5 billion (7%). Japan is by far the smallest market for pure-play foundry sales and is forecast to hold only a 2% share in 2013, with its foundry market expected to be worth less than $1.0 billion, which is one reason that UMC closed its Japanese foundry fabrication facility earlier this year. Six of the 10 largest fabless/fab-lite semiconductor companies in the world—Qualcomm, AMD, Broadcom, Nvidia, Marvell, and LSI—are headquartered in the Americas region. Each is a customer of TSMC. Apple will soon be another significant customer for TSMC. GlobalFoundries also counts Qualcomm, AMD, Broadcom, and LSI among its major customers. In the next five years, IC Insights expects an increasing share of pure-play foundries sales to come from the Asia-Pac region as Taiwanese and Chinese IC design houses continue to advance. Among the four large pure-play foundries, only China-based SMIC counts the Asia-Pac region as its largest market. IC Insights believes that the Japanese market for pure-play foundry services also will increase in the future. The fabless IC company infrastructure in Japan is very small and not expected to increase much over the next five years. Most of the increase in foundry demand in Japan is expected to be due to a greater number of Japanese IDMs (e.g., Renesas, Toshiba, Sony, etc.) utilizing leading-edge IC foundry services. The number of semiconductor manufacturers in Europe has slowly eroded over the years. Three large Europe companies—ST, NXP, and Infineon—have employed a fab-lite business model for some time. Other significant fabless semiconductor suppliers in Europe include CSR, Dialog, and Lantiq. IC Insights does not foresee Europe representing more than 5-7% of pure-play foundry sales in the near future. All of the increase in pure-play foundry sales in 2013 is expected to be due to ≤28nm feature size device sales. IC Insights continues to believe that the more profitable (i.e., successful) major pure-play foundries, which include TSMC, GlobalFoundries, UMC, and SMIC, will be those that keep at the leading edge of the process technology roadmap.